One of the great joys of the NYC subway system is that so much of its rich heritage is still on display for all to see. The preservation of its ancient terra-cotta platform signs is already well-documented. 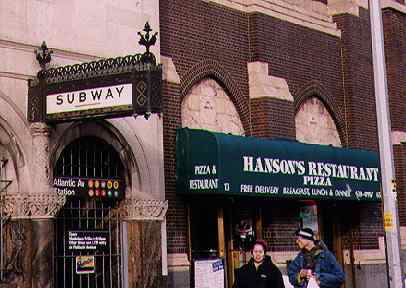 Here, we’ll take a look at the various ways the city marks subway stations at street level. 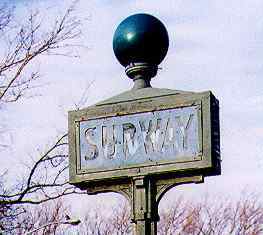 The removal of an advertisement revealed a handsome blue and white ‘Subway’ sign at the President Street station of the IRT #2 in Brooklyn, a reminder when many subway signs were made of enamel. On Fort Washington Avenue near the Cloisters is this distinctive stencil-style subway sign that marks the 190th Street station on the IND (A) line. 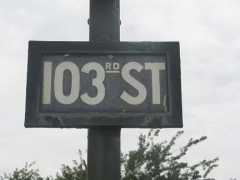 The sign dates from the 1920s, when the 190th Street station was built. It shows definite Art Deco design traits. 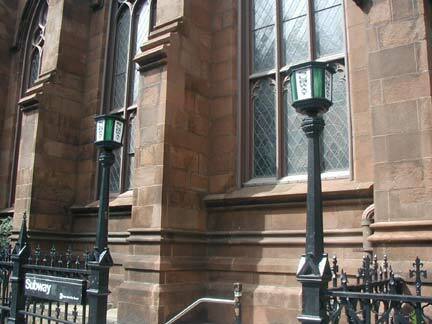 The green bulb above the sign signifies that this entrance is always open. 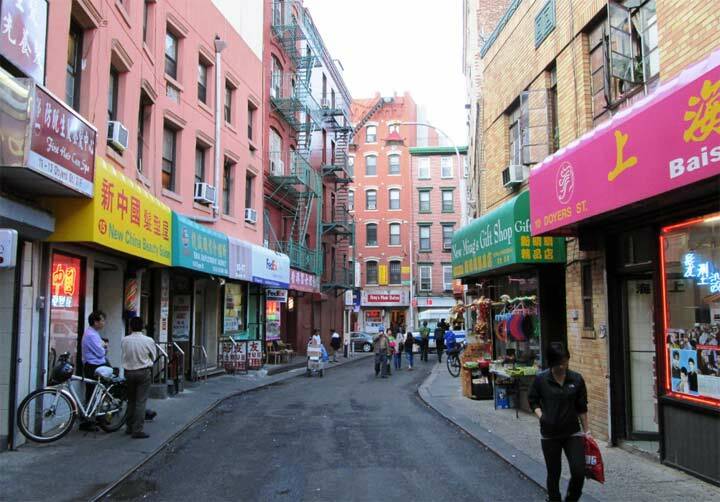 It’s a relatively recent development, having been placed there in the early 1980s. 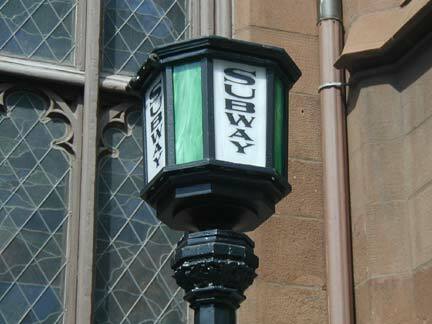 Closer view of the Cloisters subway sign. Formerly, the sign was illuminated though I doubt that’s the case today. 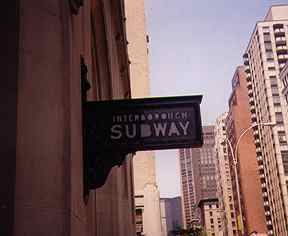 From our Forgotten Classics file, this Interborough Subway sign of similar design once graced Park Avenue just south of 42nd Street (that’s Grand Central Terminal in the background.) The 4, 5, 6 and 7 trains are all available here. 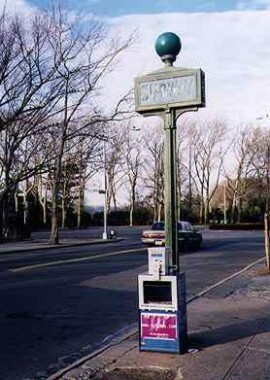 This sign did not survive the 1980s. 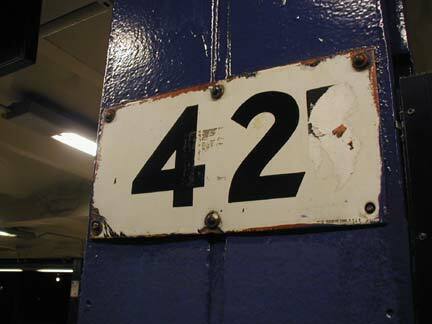 Somewhat similar in style, but with less panache, is this indicator which has probably marked the Queensboro Plaza station in Long Island City for many years. 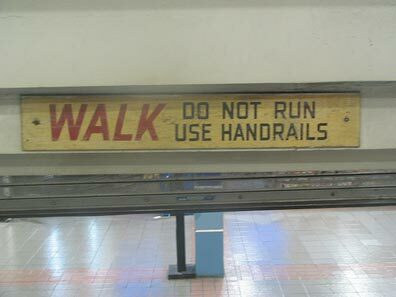 The station was built in 1917 but the sign isn’t quite that old. 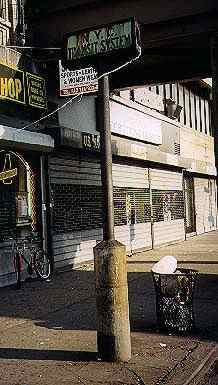 With its iron and concrete base, it’s survived quite a few assaults over the years from out-of-control cars! 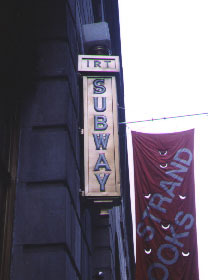 The New York Life Building in Midtown has its very own subway entrance marked with this sign, which fronts the 28th Street station on the IRT (#6)… the only subway line east of Sixth Avenue. 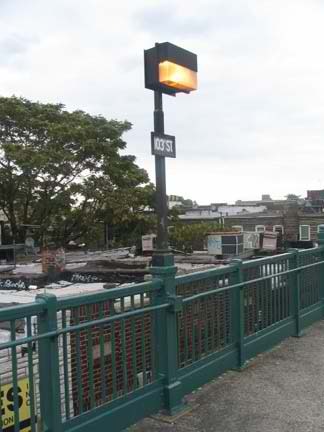 103rd St (formerly Alburtis Avenue station) on the #7 Flushing line has kept a few of its tiny painted lamppost-mounted station signs. 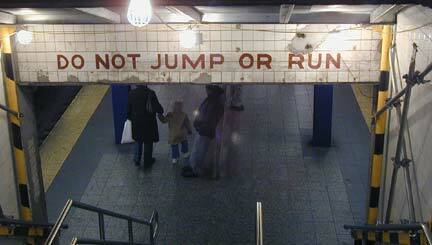 One similar sign remains at the end of the eastbound 111th St station on the Flushing. 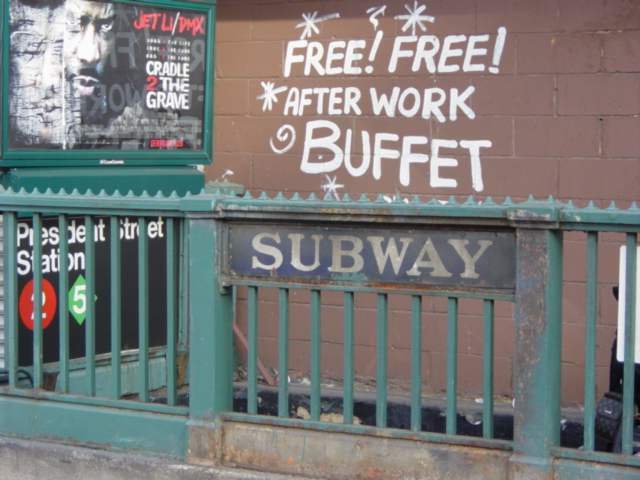 A similar sign to the Met Life sign can be found on Fulton & William Streets, leading to the #2 and #3 lines. 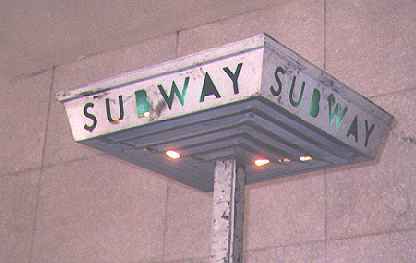 Meanwhile, the Jay Street sign on the IND, below, has a 1950s-era modernistic design Note that this sign maintains the green light tradition: a green light means this entrance is always open. 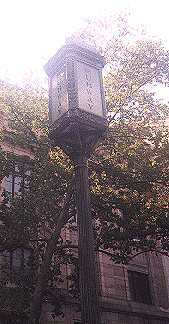 The Williamsburg Building, Brooklyn’s tallest skyscraper, has a priceless ornate subway sign on street level. At this point, many of the city’s subway lines converge…the IND (B,D), IRT (2,3,4,5) and BMT (M,N, R). 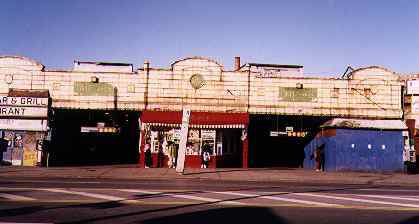 One of the two original green and red plaques on the exterior of the Stillwell Avenue station. 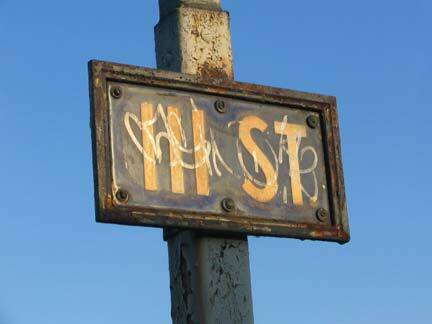 12/2004: These signs are regaining their place on the Stillwell marquee as it is being renovated. 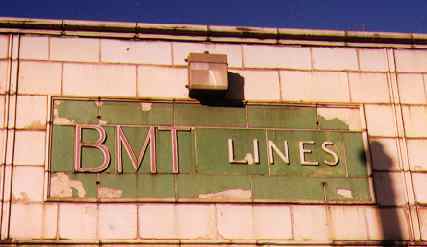 Looking a bit worse for the wear of seven decades, this is an original BMT sign on Surf Avenue that leads to the cavernous Stillwell Avenue station. 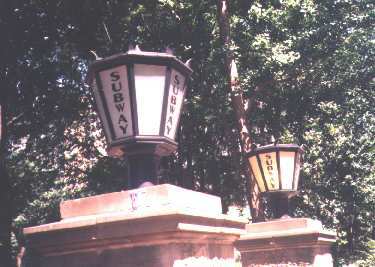 Central Park has a number of quaint entries in the fancy illuminated subway sign sweepstakes. 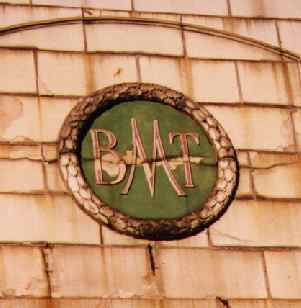 The Montague and Clinton Street entrance on the Court St. station on the 4th Avenue line (R,M, N) retains its early-BMT era painted glass station indicators. Hand painted warning at East New York (A,C,J, L). Lost to renovation. Leftover enamel and metal 42nd St sign on 8th Avenue Line (A,C,E) platform. 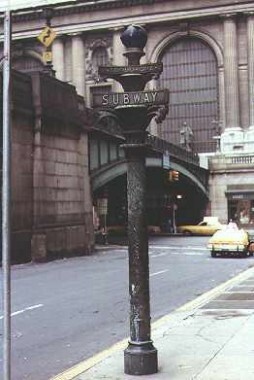 The sign is mounted on a pillar facing the tracks, in an unusual arrangement. 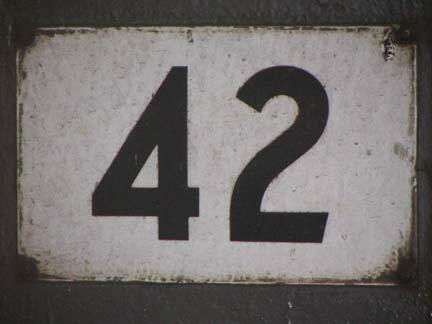 1970s-style sign. 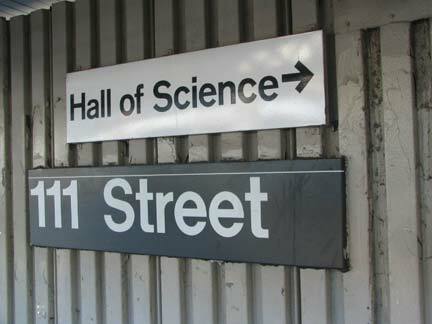 The MTA now uses a gray and white scheme for local landmark signs like this now, and has replaced the Akzidenz Grotesk typefont with Helvetica.